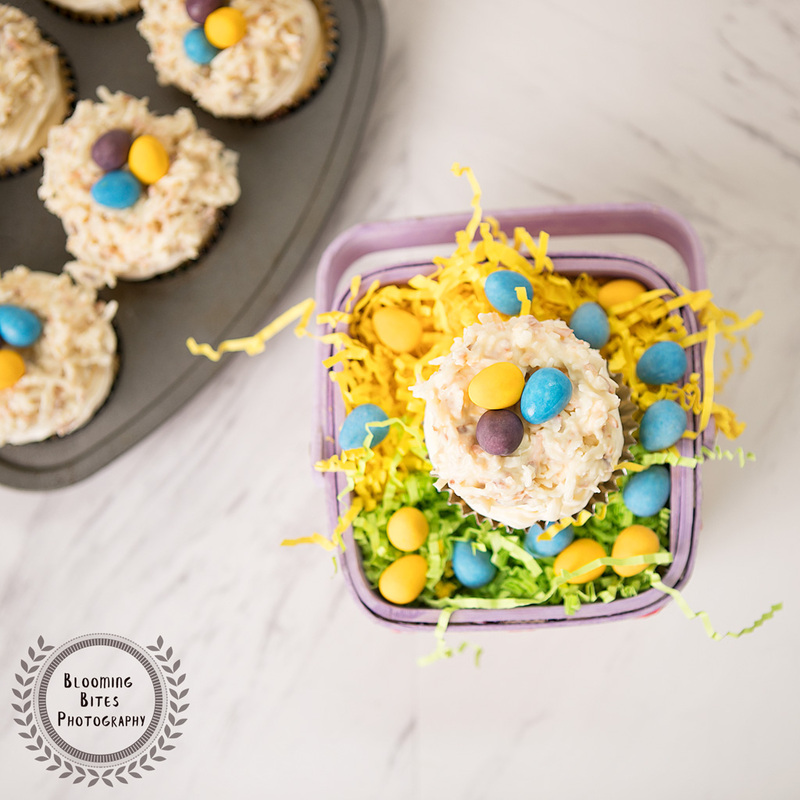 Our week of Easter posts is in full swing, and when it comes to this special holiday, we love to keep things traditional. 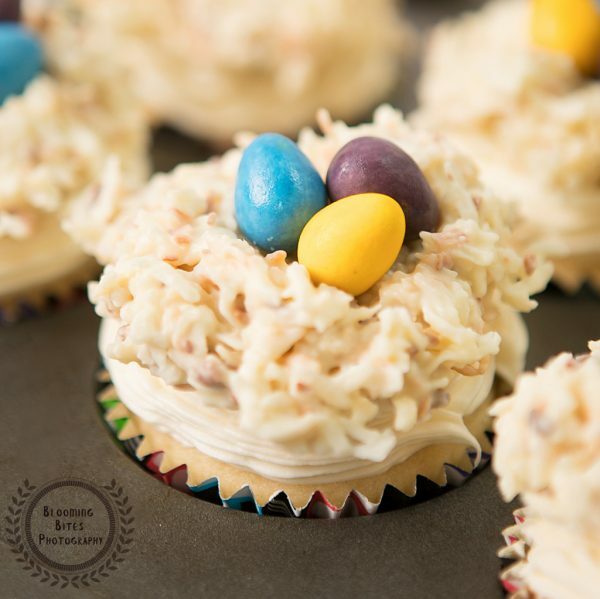 We’re starting you off with these adorable cupcakes with toasted coconut and white chocolate egg nests on top. How cute do they look!? And oh so delicious. 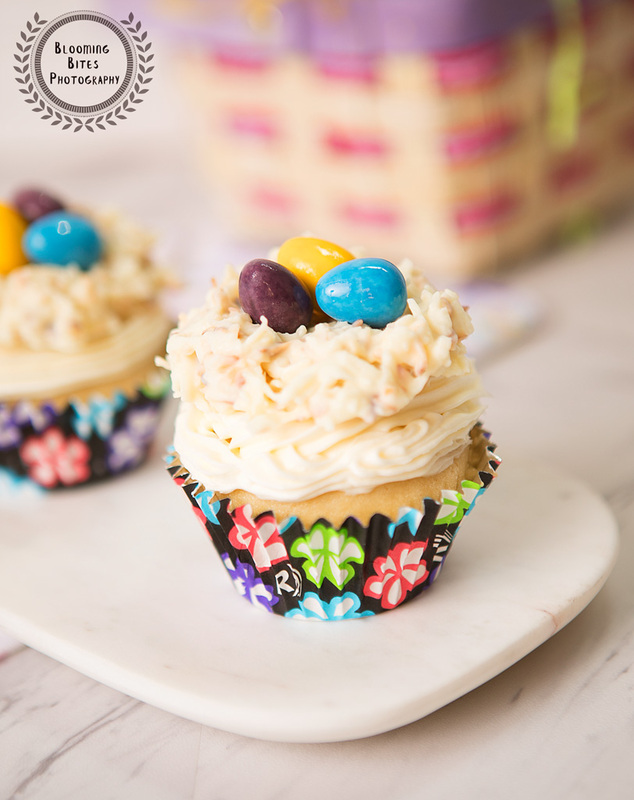 These are the kind of easy to make decorations that everyone should keep in their recipe box. We ended up giving most of them away to the kids in our family, and this part is always the most rewarding; the excitement in their eyes is priceless, and it’s cute artsy recipes like this that gets them interested in cooking. Not to mention the quality time spent together while doing a productive activity. Win win right? Now, the cuteness level of things cupcakes should equal or surpass the level of tastiness, do you agree? For the perfect fluffy cupcake that we all love, be sure to sift your dry ingredients before adding your wet ones. A step that is too often skipped over, and it really makes a big difference. We would also like to take the opportunity to mention foil lined baking cups are where it’s at. Don’t forget to lightly grease them, but we highly recommend these for the perfect looking cupcake. If you’re anything like us, the presentation of a recipe is just as important as taste. 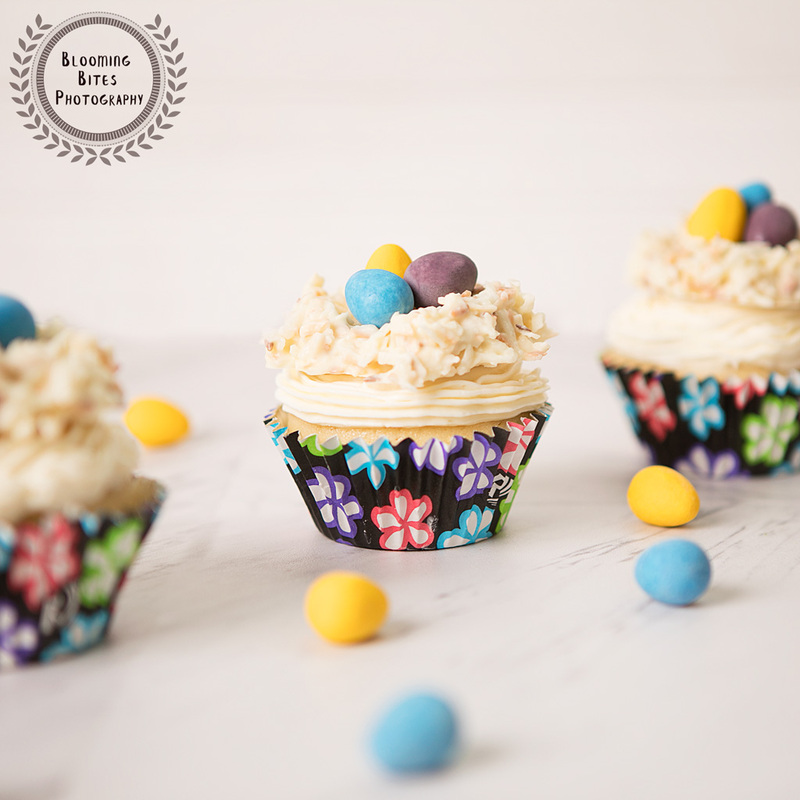 Stay tuned for more festive easter recipes coming your way soon. 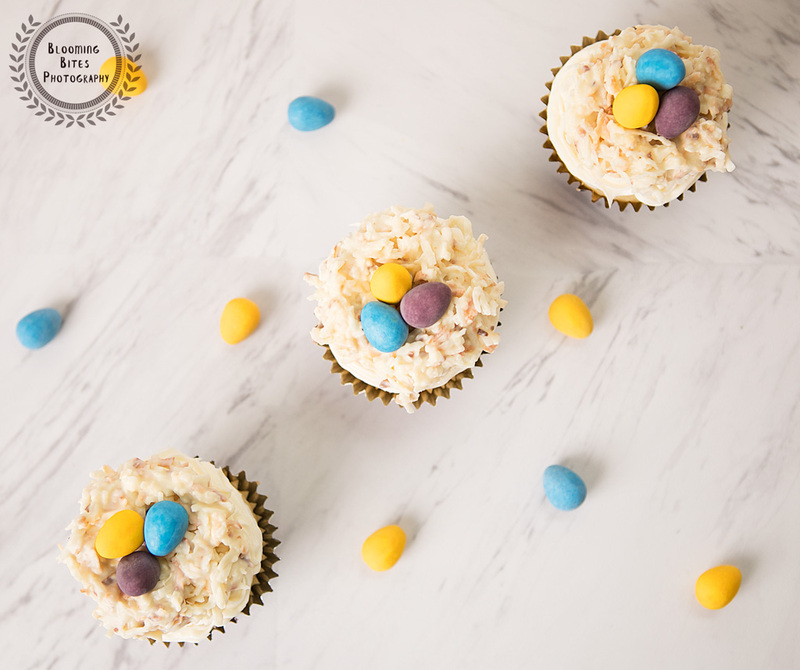 In the meantime, try these cupcakes and let us know how you like them. Happy baking everyone! Melt the chocolate in the microwave on low in 20 second increments, stirring after each. Let the chocolate cool slightly for about 2-3 minutes so it is not too hot that it melts the butter and cream cheese. Preheat oven to 300 degrees. Spread out coconut on cookie sheet in a single layer and place in oven. Pull out sheet and stir coconut around and place back in oven in 5 minute intervals until completely toasted and browned. Microwave white chocolate chips in 30 second intervals until melted. Slowly add in toasted coconut to the melted chocolates until combined, making sure not to add all the coconut as it needs a good layer of chocolate to adhere. Drop spoonfuls of chocolate coconut mixture on wax paper, pressing down in the middle to create "nest" shape. Place a few candies of choice in the center to resemble eggs. Let harden in fridge for 10 minutes before removing and displaying on plate.